For anyone that works from home, having a separate workroom is a must. A dedicated, focused space with all the right equipment and resources where they need to be makes life much easier. It also helps to set a clear boundary between work and domestic life, making it easier to switch off and relax at the end of the day. For parents and others with childcare responsibilities, this division is all the more important, but it can be complicated by the need to entertain and watch over the kids. Creating a fantastic kids’ playroom with discreet surveillance can help to solve these problems. Even shy kids like to have some opportunity for adventure and it’s simple to incorporate this into a playroom. 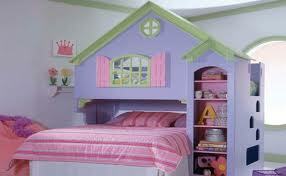 Whilst playhouses and tents have traditionally been thought of as outdoor toys, they work just as well inside. Bunk beds disguised as houses, pirate ships or castles can make great play spaces and provide somewhere to nap even if the kids usually sleep elsewhere. Ladders, climbing bars and rope bridges are ideal for daring children and the use of rubber floor coverings means they’ll be safer if they should fall, as well as making the room feel bouncier and more fun. To add to the atmosphere, parents can try painting murals on the walls to suit kids’ favorite themes. Floor mats that look like shark pools, farms or roads can further facilitate play. Good playrooms also provide space for learning and creativity. Vivid decorating with unique colors and finishes helps to create an inspiring atmosphere, whilst child-sized furniture encourages a sense of ownership and increases confidence. It’s a good idea to have a dedicated art table, and using blackboard paint on a section of wall means that kids can also draw on a large scale. Child-height storage tables are ideal for things like Lego building and playing with toy cars, and they make it easier to keep track of different bits and pieces and will help avoid getting them underfoot. To maintain some degree of order, every playroom needs to have amble storage space. Cube shelves are a good idea as they can store lots of small boxes for holding smaller items, color coded and labeled (preferably by the kids themselves) to make them easy to find. Storage can often be selected to fit in with the room’s theme – a pirate chest can be created from a traditional ottoman. There are several different ways to keep watch over kids at play without having to be in the same room. If the workroom and playroom are next to each other and the wall in between is not a supporting wall, a window can be fitted into it, or there’s the option of fitting a one-way mirror. Miniature cameras that transmit to a computer are now quite inexpensive and using several can enable observation of all a room’s nooks and crannies. For those who don’t find the noise too distracting, there’s also the option of using microphones. Knowing any emergency can be quickly spotted makes it much easier to relax and focus on work. Guest post: Aimee is an enthusiastic, well-educated freelance writer with a passion for Interior Design. She is fascinated at how different patterns, textures and lighting can completely change the look and atmosphere of a room. One day she would like to run her own Interior Design company, but for now is happy experimenting with new designs in her own house.